We begin with news from the IPL. A clinical Chennai Super Kings continued their unbeaten run at home with a seven-wicket thrashing of Kolkata Knight Riders on Tuesday. Chennai put on a top-class bowling display, limiting KKR to an under par 108/9. This, despite an unbeaten 50 off 44 balls from the dangerous Andre Russell. CSK pacer Deepak Chahar rattled the KKR top-order with early strikes including that of the big-hitting Chris Lynn as KKR trudged to 29/4 in the powerplay. Chahar’s bowling, which fetched him three wickets, ensured CSK were always on top during the match. 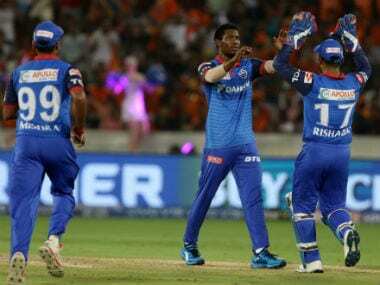 Chennai’s spinners Harbhajan Singh, Imran Tahir, and Ravindra Jadeja then strangled the KKR batting, conceding just 53 runs in their combined 12 overs. Harbhajan and Tahir took two wickets each while Jadeja claimed one as well. That meant a lot depended on the in-form Russell, and he tried to play in his trademark style but found limited success, finishing with five fours and three sixes. With just 109 to get from 20 overs, CSK were never in any trouble during their chase. Shane Watson and Suresh Raina fell cheaply, scoring 17 and 14 respectively. Faf du Plessis, who was 43 not out from 45 balls, and Ambati Rayudu, who made 21 runs, went about their job with little fuss. The South African batsman, who made 54 in his first game on Saturday, anchored CSK’s innings to ensure a smooth victory in the 18th over. Deepak Chahar was named the Player of The Match. Some bad news from athletics. Asian champion shot putter Manpreet Kaur has been banned for four years by the National Anti-Doping Agency (or NADA) for flunking four dope tests in 2017. The period of suspension is considered from 20 July 2017, the date of her provisional suspension, according to an order of the anti-doping disciplinary panel (ADDP) of the NADA dated 29 March. She has the option of filing an appeal before the Anti-Doping Appeal Panel. The shot putter tested positive four times in 2017. The first was at the Asian Grand Prix at Jinhua, China on 24 April, followed by Federation Cup in Patiala on 1 June, then at the Asian Athletics Championships in Bhubaneswar on 6 July, and finally the Inter-State Championships in Guntur on 16 July. She won gold in all these meets. She had also set a national record of 18.86m during the event in China. She tested positive for steroid metenolone at that event. In the other three meets in India, she tested positive for the stimulant dimethylbutylamine, a substance that has an almost similar structure as the more famous methylhexaneamine (or MHA). The ban means Manpreet will lose the gold she won in the 2017 Asian Championships in Bhubaneswar as well as her national record. The panel ruled that all her competitive results from the date of sample collection would be disqualified. An update on day two of the auction at the Pro Kabaddi League on Tuesday. Defender Mahinder Singh and raider Manjeet Singh fetched highest bids as category B players in their respective classes. Bengaluru Bulls bought Mahinder for Rs 80 lakh while Puneri Paltans bought Manjeet for Rs 63 lakh. In the all-rounders category, Sandeep Narwal was purchased for Rs 89 lakh by U Mumba. Among foreign players, Mohammad Esmaeil Nabibakhsh of Iran was the highest paid player with a Rs 77.75 lakh bid on day one of the auction. In all, a total of Rs 50 crore were spent by the 12 franchises to buy 200 domestic and foreign players over the two days. Siddharth Desai and Nitin Tomar remained the only players sold for over a crore. The Indian women's football team missed an opportunity to qualify for the third round of the 2020 Olympic qualifiers after they were held to a 3-3 draw by Myanmar on Tuesday. India needed a win to top Group A of the Olympic qualifiers Round 2 but squandered the lead twice to play out a draw and bow out of the competition at the Mandalar Thiri Stadium in Mandalay, Myanmar. Sandhiya Ranganathan gave India an early lead in the 10th minute but Myanmar's hat-trick woman Win Tun scored the equalizer in the 17th minute. Tun scored again in the 21st minute but Sanju equalized for India in the 32nd minute. India surged ahead in the 64th minute when midfielder Ratanbala cut into the box from the right flank and sent a curling shot that crashed into the back of the Myanmar net leaving the opponent custodian dumbfounded. However, just eight minutes later, Tun completed her hat trick, finishing from close range to make it 3-3. India and Myanmar scored seven points each from three matches but the hosts advanced to the third round because of superior goal difference (plus 8 as compared to plus 4 of India). Only one team qualifies for the third round from each group.